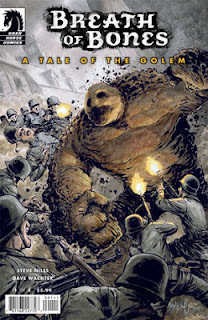 The Fellowship was fortunate enough to obtain a copy of BREATH OF BONES: A TALE OF THE GOLEM #1 from Dark Horse Comics. Steve Niles writes, and Dave Wachter draws. It’s 1944, and the war goes hard in Europe. Noah’s town has been spared so far, but it’s only a matter of time. Especially now that the British plane has crashed nearby. There are no fighting-age men left in the town, but Noah’s grandfather has a plan. And it may be up to Noah to put it into action. I feel like I’ve known Noah and his grandfather for years, and that’s exactly what Niles wanted with this first issue. The really good monster stories are not about the monster; they’re about the normal people around it. They’re about the collateral damage, really, and what we sometimes have to do to survive. And this book sets up for that beautifully. Wachter’s art really helps to sell the normalcy of it (bet he’s not expecting praise like that J). Come on, everybody; let’s get hooked on this one together. Pick it up and let’s follow along, to see how stories get told right. BREATH OF BONES: A TALE OF THE GOLEM #1 is available now at your LCS or online at darkhorse.com.